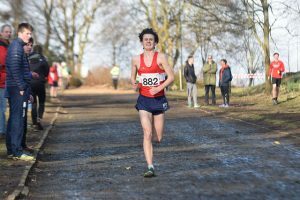 The weather and ground conditions for this year’s Scottish Cross Country Championships held at Callendar Park in Falkirk were the most favourable in a number of years. As usual Cambuslang Harriers put in a strong performance in spite of some key individuals in the senior men and women, under 17 and under 20 men age groups not available due to injury or illness or in the case of Grant Sheldon, the Scottish 10K road and 5K track champion, understandably honing his final preparations in Scotland before flying out shortly to Australia to represent Scotland in the Triathlon at the Commonwealth Games. Our under 13 boys team of Stewart Millard, Lewis Roddis, newcomer Ollie Chung and Fearghus MacGregor rose to the occasion and packed well to lift the national team title in their age group. 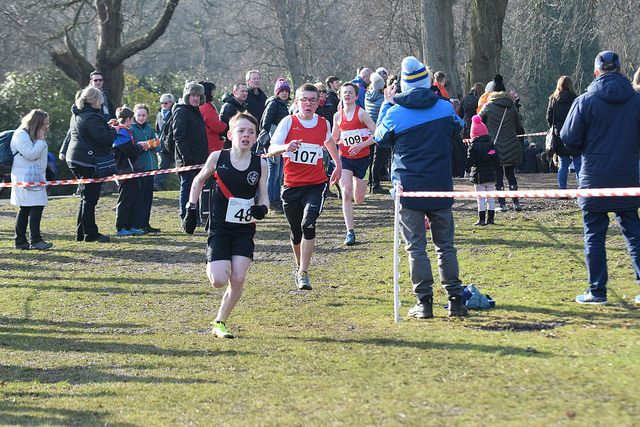 Stuart 12th, Lewis 14th and Fearghus 44th , in spite of a fall, showed the progress they had made from last year when their respective finishing places in the under 13 category were 89th, 122nd and 69th. Their progress in the sport can be put down to their consistent training at the club under the watchful eye of their coaches along with the parental support given. Calum Murray, Richard Uyiosasere and Joseph Gallagher provide back up. 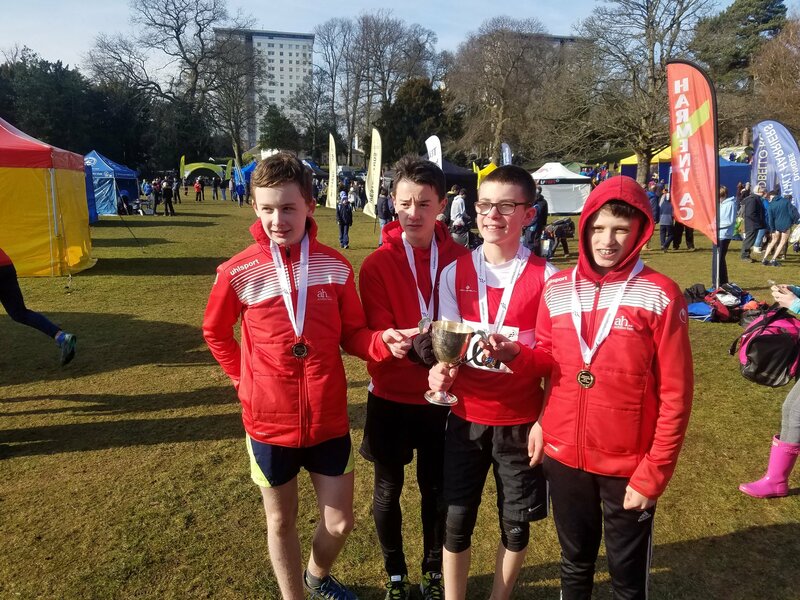 The under 15 boys quartet of Brodie Aitken, Michael Black, Aaron Grew and Joa Fairweather also combined well to finish in the bronze medal position. Again both Brodie and Michael showed significant improvement from last year advancing from 33rd position to 15th and from 89th to 26th. The club’s next finishers in order were Zak Povey, Robbie Woods, Arlo van de Peer and Mark Cassidy. 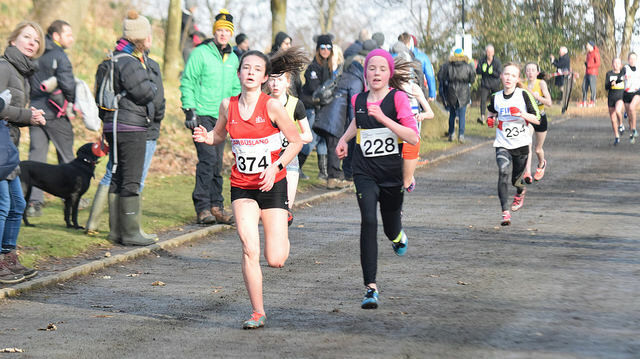 Both the under 13 and under 15 girls put in creditable performances. Millie Nicholl led home Eva Ritchie, Abbie McLue and Eilidh Kennedy in the team event. At the time of writing this report the team positions are still being worked out due to a malfunction with the electronic race chip timing. Francesca Fairweather, Korin Weir Stuart, Morvern Crawford and Cara McDowall next crossed the line. The under 15 girls quartet of Niamh Riggins, Susie McLaughlin, Shona Carey and Peggy Nan Rodger finished 11th team. The club’s other finishers were Maura MacKinnon and Chloe Burton. Amy Craig and Holly Brock finished in tandem in the under 17 girls event. In spite of a decimated under 17 boys team Cambuslang finished in 8th position thanks to Ruairidh MacGregor, Drew Pollock, Andrew Carey and Aidan Tittmar with Caolan Millard in support. Likewise the under 20 men were thin on the ground on the day and did not have a team. However, Gavin Smith had an outstanding run to take 6th place in a highly competitive field while Eamon Carr in his first year in that age group put in a solid performance. The senior women trio of Kirsty O’Brien, Jennifer Reid and Lesley McArdle acquitted themselves but the club was lacking a 4th runner to complete a team. However, Cambuslang finished 24 runners in the men’s event. In spite of solid packing from Craig Jardine, Stuart Gibson, Kevan Harvey, Iain MacCorquodale, Fraser Stewart and Iain Reid, the club captain and first M40 in the race the sextet was pipped for team medals by Central Ac, Corstorphine AC and Shettleston Harriers. Nevertheless there were excellent debuts in this event from newcomers Kevan and Fraser. Alasdair Campbell, Colin Reilly and Justin Carter offered close support with a flood of red and white vests closing in the following order – Ritchie Carr, Michael Healy, Thomas McDonald, Iain Nicholl, Tony McCutcheon, Alick Walkinshaw, Mick O’Hagan, Des Dickson, Frank Hurley, Dan O’Connell, Scott Hunter, Willie Fairley, Ken McInnes, Eddie Carr and John Kelly. Well done to all our athletes and support team of coaches, officials, parents and friends. Colin Stephen again deserves credit for capturing our runners on camera and also to Alan Wylie and Willie MacRury who answered the call to act as race volunteers. A final vote of thanks goes to the Scottish Athletics officials and staff and to the members of Falkirk Victoria Harriers who again kindly hosted the championships. 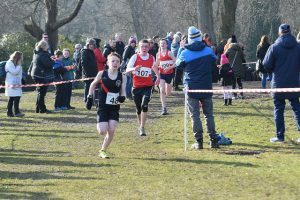 Cambuslang Harriers returned from the Masters Cross Country Championships held at Kilmarnock with 8 individual medals and two team medals across the age groups from 40 to 65. 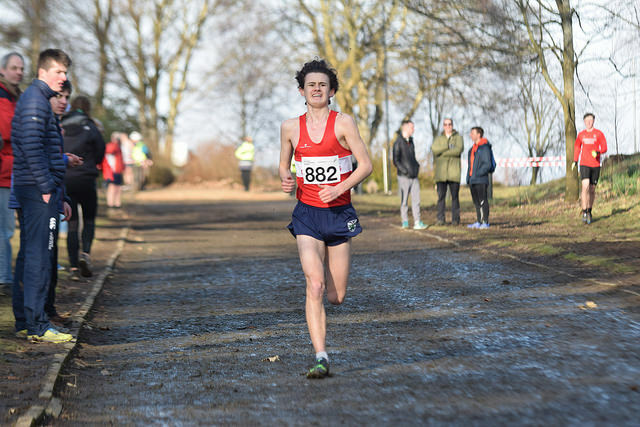 In the M40 category Iain Reid had a fierce battle throughout with defending champion Jethro Lennox of Shettleston only to lose out by a few strides at the finish. With Iain taking M40 silver and with support from the ever improving Justin Carter and resurgent Stevie Wylie, who lifted M45 silver and bronze medals, and from Iain Nicholl the Cambuslang team was completed. Despite the valiant efforts of the quartet to retain their team title Cambuslang narrowly lost out to Corstorphine AC on count back. Both clubs had 66 points but Corstorphine took team gold as their final counter crossed the line before Cambuslang’s. By coincidence there was also a count back situation last year with Cambuslang edging out Corstorphine on that occasion. It was good to see Iain Nicholl winning his first Scottish medal as a reward for his enthusiasm and commitment to the club. The finishing order for our other M40 runners was Mick O’Hagan, Tony McCutcheon, Scott Hunter and Willie Fairley. Colin Donnelly although in the M55 category was the first runner over 50 home. He duly retained his age category title and led the M50 team of Chris Upson and Alick Walkinshaw, the bronze M55 winner, to the team title ahead of Shettleston and Corstorphine. Eddie Stuart retained his M60 title in spite of recent health issues with Paul Thompson not far behind in the silver medal position. Behind them Stan Mackenzie on the comeback trail after a lengthy injury, Des Dickson and Dan O’Connell crossed the line in quick succession. The M65 plus runners event was held in conjunction with the ladies O40 race. Frank Hurley was a clear second in the M65 category. Unfortunately representation from our ladies was curtailed due to injuries and illness. However, Jennifer Reid ran her usual gutsy race to finish 13th in her age category. At the Scottish Masters Indoor Championships the following day at the Emirates Justin Carter, Frank Hurly and Chris Upson displayed remarkable powers of recovery to compete over 1500 metres with Frank lifting M65 gold and Justin M45 bronze in a personal best. Multi Scottish and UK medallist Kerry-Liam Wilson took M45 silver in his indoor debut over this distance while club debutant Michael Healy gained M40 bronze in a personal best. Elsewhere at the weekend there were 5K parkrun victories for Richard Carr, Susie McLaughlin and Kevan Harvey with second and third place finishes for Michael Barker, Eva Ritchie and Michael Black. 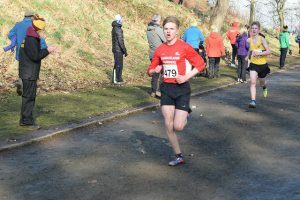 Jamie MacKinnon secured the U20 prize at the Renfrewshire 5 mile road race.